Timeless, elegant and uniquely hand-crafted - it's the urn your loved one deserves. Honor their memory by displaying their ashes in a hand-crafted, elegant cremation urn from Smart Choice. This timeless design is suitable for the home or office, fitting in handsomely with your décor. Just like those cherished memories, our high quality adult urn will last forever. That's because it's cast from premium aluminum, and hand crafted with a stunning, durable finish. This makes each of these urns for human ashes one of a kind, just like your loved one. These large urns are durable, and have a good solid weight to them without being overly heavy. We're proud to say that we think these are among the best funeral urns on the market, and best suited for your memorial service, mantel piece or other special location. In fact, they're the SmartChoice. Be sure to explore our storefront for other accessories such as keepsake mini urns, urn jewelry and necklaces, register guest books, and styles of urns for human remains, among other memorial and funeral supplies. 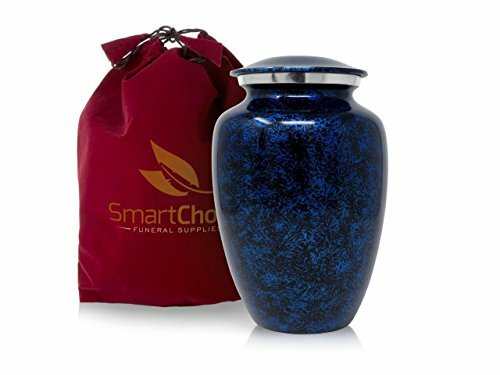 Honor your loved one by displaying their ashes in a hand-crafted, elegant urn from SmartChoice. This timeless design is suitable for the home or office, fitting in handsomely with your décor. Just like those cherished memories, our high quality adult urn will last forever. That's because it's cast from prmium aluminum, and hand crafted with a stunning, durable finish. Standing securely on a felt base to protect delicate surfaces, your loved one's ashes are secure under a tight fitting, threaded lid. Dimensions: (H x L x W) 8 x 8 x 11. Capacity of roughly 200 cubic inches. If you have any issues with your purchase, just get in touch and we will be at your service to make it right - no hassles. If you have any questions about this product by SmartChoice, contact us by completing and submitting the form below. If you are looking for a specif part number, please include it with your message.